Since the mid-1980s , Morocco’s economic and political decision-makers have pushed for the liberalisation, privatisation and the lowering of the trade barriers agenda that has been prevalent in the country since 1983. Most public companies were sold. Since the early 1980s, and under the constraints imposed by the structural adjustment programs, Morocco has launched a wide process of economic liberalization, privatization, deregulation and fiscal austerity. 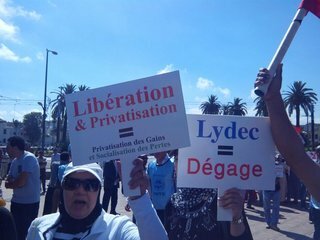 If the privatization policy adopted by Morocco has concerned first the transfer of public assets to the private sector, it also took ‘softer’ guises through the commercialization of public services and transfer of their management to the private sector, including private/public partnerships. These operations focused particularly on local public services such as urban public transport, water and electricity supply, sanitation, waste management etc . Faced with accelerated urbanization and subsequent proliferation of squatter settlements, the creation of slums and urban poverty resulted in strong pressure on public services and increased demand for social services. The municipal public utility Régie Autonome Intercommunale de Distribution d'Eau et d'Electricité de Casablanca (RAD) had a poor service record in the early 1990s . This context has been exploited by donors like the World Bank and the EU and bilateral financial, to impose the passage from the ‘public’ model to another model where the state delegates, and opens to interventions by other actor, namely private organizations. In this context, emphasis was put on the need for public–private partnerships (PPP) . Therefore the government decided in the mid-1990s to bring in a private company to manage the city's water, sewerage and power networks. Finally, a consortium led by Lyonnaise des Eaux (now SUEZ), was awarded the 30-year concession without a competitive tender. The consortium was called Lydec and originally included Lyonnaise des Eaux (35%), Elyo (24%), Agbar (5%), EdF (18%) and Endesa (18%). The contract was signed on April 28, 1997, between Lyonnaise des Eaux, and the President of the Council of Greater Casablanca (Communauté Urbaine de Casablanca) . The privatization process itself was politically motivated and dominated by the central government. While invitations to tender for public–private partnerships for public service management were made on the basis of international invitation to tender in other major world cities, the Moroccan authorities preferred to use a direct agreement to grant the management of water and electricity supply and sanitation in Casablanca to the Lyonnaise des Eaux. This decision was taken by the highest authority in the country, the king himself. He officially received the CEO of the Lyonnaise des Eaux in the spring of 1994 to discuss the conditions of the participation of the company in a number of investment projects in Morocco, including concessions for motorways and local services, and the construction of social housing . Upon announcement by the press close to the business community, in early 1995, the proposed privatization of RAD by Lyonnaise des Eaux sparked a strong reaction within both the local municipal council, the Urban Community of Casablanca (UCC), and within the RAD, as well as in the ranks of the General Confederation of Enterprises of Morocco (representing Moroccan employers) and trade unions. Very quickly, the opposition to this project was led by local officials from the Moroccan left (the Socialist Union of Popular Forces) using an argument based primarily on defending the autonomy of decision making of local officials and the preservation of national sovereignty. The strength of the leftist opposition, however, did not last long. Indeed, after an initial withdrawal of the LYDEC concession licence in February 1996, the UCC was called by the Interior Ministry to hold a special session the following month. This served to remind the elected officials of Casablanca of the ‘legal’ sharing of authority in Morocco between ‘a strong state’ with unlimited powers and local authorities whose powers are still heavily influenced by the tutelle (supervision) of a ‘dominant’ Ministry of the Interior. Elected officials could not freely define the mode of management of urban services, let alone exercise the prerogatives of local participation in urban affairs . In Morocco, social mobilization for the democratization of access to water has developed in parallel with the privatization of this sector. The emergence of social mobilization can be explained by a whole host of factors including the liberalization of the political system and the increase in personal freedoms, and the impact of neoliberal economic reforms and the increase in protests against the excesses of the capitalist world system, as manifested in the rise of the anti-globalization movement. It is in this context that we have to situate the mobilization against the delegated management of water in Casablanca. From July until November 2006, residents of Greater Casablanca received much higher water bills than they used to pay. Following a restructuring of tariff bands accompanied by a rise in the purchasing price from the water producers, thousands of families saw their bills double. Pensioners, whose pension does not exceed 1500 DH per quarter, were surprised by water bills and electricity of up to 1200 DH for only one month. Enterprises had to cope with 110 per cent increases in their water bills. The protesters had characteristics that differentiated them from political parties and made them actors who could potentially ‘reinvent’ politics, particularly for younger generations. The repertoire of collective action was similar to that which is generally used by social movements – it combined sit-in, spontaneous demonstrations, petitions, seminars and roundtables for popular education. There were also links with the alternative globalization movement . Why? Explain briefly. A recent report by the Cour des Comptes de Casablanca denounces the financial manipulation of Suez Environnement. The magistrates of the Court refer to suspicious financial transactions for the benefit of parent companies, a biased system in favor of the provider, as well as numerous breaches by Lydec in relation to its contractual commitments .